Are you a fan of country music? 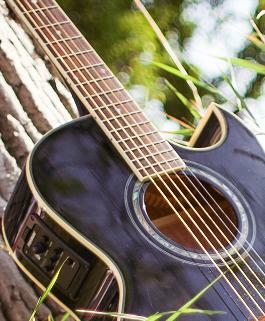 Do you have an acoustic guitar handy? If so, you can probably learn to play the four songs discussed here with relative ease, provided you already have a few basic guitar skills. If you understand song structure, rhythm and strumming patterns, and you’re able to fluidly switch between chords, you should be able to just pick up your guitar, warm up those vocal chords, and start playing! Tim McGraw is a very popular country musician, and for a good reason. And even better, this song by him is rather simple to play, so you’ll be able to play and sing along with it with only a little practice. The song consists of only three different chords, so if you can master switching between them, you should be able to pull it off. Unlike some other country music stars, Florida Georgia Line is a duo, but that doesn’t mean their music has to be twice as complicated to play! In “Cruise,” there are only four chords being used, and the progression remains the same for the entirety of the song, making it a pretty straightforward track to play along to. Taylor Swift is also very popular, and this song by her is relatively easy. She only uses four different chords to play “Everything Has Changed,” so playing and singing at the same time shouldn’t be a problem you can’t overcome. George Strait is known to be one of the most influential country music singers, and lucky for you, even he has a few songs that beginners can play and sing along to. In “Check Yes or No,” there are only four different chords being used throughout the song. Country music is fun to play and sing, and many other country songs are also easy to play once you know the chords. Keep in mind though that some songs may require the use of a capo, so you should think about investing in one. Also, a capo can come in handy when you find a song you really like, but the vocals are out of your range. Moving the capo around might not allow you to play along with the recording, but you’d definitely be doing your vocal chords a favor!